Expedition operators are concerned at the number of climbers’ bodies that are becoming exposed on Mount Everest as its glaciers melt. Bodies are being removed on the Chinese side of the mountain, to the north, as the spring climbing season starts. More than 4,800 climbers have scaled the highest peak on Earth. They point at Nepal’s law that requires government agencies’ involvement when dealing with bodies and said that was a challenge. In 2017, the hand of a dead mountaineer appeared above the ground at Camp 1. 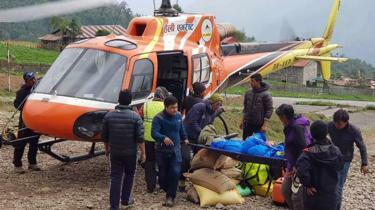 Expedition operators said they deployed professional climbers of the Sherpa community to move the body. The same year, another body appeared on the surface of the Khumbu Glacier. Also known as the Khumbu Icefall, this is where most dead bodies have been surfacing in recent years, mountaineers say. Another place that has been seeing dead bodies becoming exposed is the Camp 4 area, also called South Col, which is relatively flat. “Hands and legs of dead bodies have appeared at the base camp as well in the last few years,” said an official with a non-government organisation active in the region. Several studies show that glaciers in the Everest region, as in most parts of the Himalayas, are fast melting and thinning. 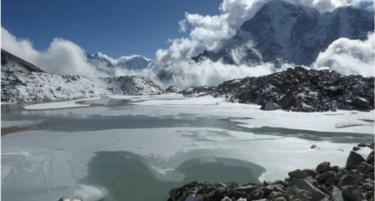 A study in 2015 revealed that ponds on the Khumbu Glacier – that climbers need to cross to scale the mighty peak – were expanding and joining up because of the accelerated melting. Nepal’s army drained the Imja Lake near Mount Everest in 2016 after its water from rapid glacial-melt had reached dangerous levels. The ice recorded a minimum temperature of only −3.3C, with even the coldest ice being a full 2C warmer than the mean annual air temperature. Not all dead bodies emerging from under the ice, however, are because of rapid glacial meltdown. Some of them get exposed also because of the movement of the Khumbu Glacier, mountaineers say. “Because of the movement of the Khumbu Glacier, we do get to see dead bodies from time to time,” said Tshering Pandey Bhote, vice president of Nepal National Mountain Guides Association. 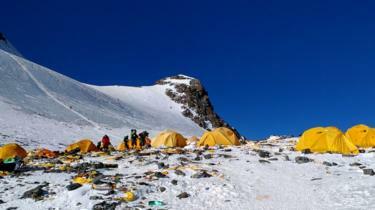 Some of the dead bodies on the higher altitude sectors of Mount Everest have also served as landmarks for mountaineers. One such waypoint are the “green boots” near the summit. They’re a reference to a climber who died under an overhanging rock. His green boots, still on his feet, face the climbing route. Recovering and removing bodies from the higher camps can be both expensive and difficult. Experts say it costs $40,000 to $80,000 to bring down dead bodies. “One of the most challenging recoveries was from the height of 8,700m, near the summit,” said Ang Tshering Sherpa, the former president of NMA. Experts say any decision over what to do with a dead body on the mountain is also a very personal issue. “Most climbers like to be left on the mountains if they died,” said Alan Arnette, a noted mountaineer who also writes on mountaineering.